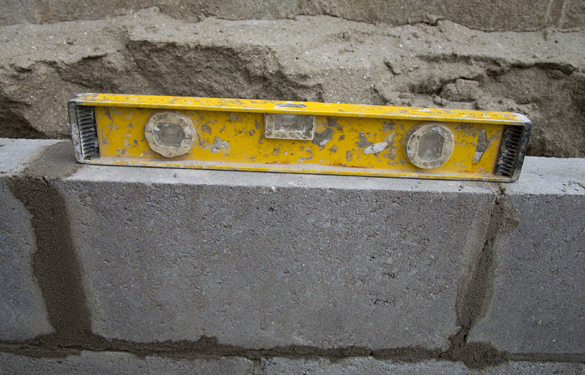 A house foundation repair can run the gamut from a rather small situation such as raising a concrete sidewalk or completing some crack repair and landscape grading near the perimeter of a home, all the way to a major house leveling project or adding a full basement to an existing home that doesn’t have a basement. These types of repairs are fairly common. All buildings and other outdoor features like patios and walkways can settle over time, but excessive movement is not good and it can have devastating effects on a home. Most foundation repairs are pretty serious situations that should be undertaken only by an experienced team of professionals that have training and experience in performing these types of repairs. Most local general handymen simply don’t have the expertise or specialty equipment to do the job. How Do I Know if My Foundation Has a Problem? As you can imagine, the amount your repair will cost will depend upon how extensive your job is. Homeowners reported to HomeAdvisor that their foundation projects cost them, on average, between $1,768 and $5,878. But each house and situation is different. Simple repairs, such as raising a walkway using a process commonly called mudjacking, is usually a quick and fairly inexpensive fix. Extensive projects will cost much more. Extensive fixes often entail a good deal of excavation and installing concrete or steel piers underneath your existing concrete foundation. One of the biggest factors why homes move is the type of soil they sit on. Extensive foundation leveling is usually needed only in situations where the soil the house sits on was either poorly prepared and compacted before the house was built, the lot isn’t well-suited to having a home on it in the first place, or the makeup of the soil itself is such that it retains moisture and expands too much when it gets wet. Clay soil expands somewhat when it’s wet and shrinks a little when it’s dry. Now this may sound like a little thing, but if the ground beneath your home is moving, expanding and then shrinking again, it can throw off the stability of the foundation that is supporting the entire weight of the home plus everything inside it. If you are pretty sure you have a structural problem, you can contact either a repair company or a structural engineer to come inspect your house. A structural engineer will not fix your problem, they will simply assess your situation and offer you a report on what they think the problem is and what you should do to correct it. If you find yourself in one of these situations, you may be concerned that your home is unfixable, but try not to worry, there are companies that specialize on fixing these types of problems.